Looking for a Jewish establishment to order Brit shalom catering for this special occasion? No better option than Chutzpah Deli in Fairfax. While you make up your mind, how do you like your kreplach? At Chutzpah, we serve it two-ways – deep fried with plenty of onions or in this comfort-filled chicken noodle soup that will warm your stomach. There is more to satiate you, from Jewish wontons to noodles, chicken, Brisket of Beef served with mushrooms, corned beef – without mayo, of course, and an assortment of sandwiches. We also have a variety of dessert options for your sweet tooth. 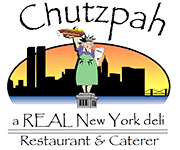 Chutzpah was established in 2001 with the intention of feeding New York style authentic Jewish meals using nothing but the freshest ingredients. Brit Shalom, the naming ceremony for Jewish families that opt out of circumcision, is an important part of the Jewish culture, which is why our catering for this event is prepared with care and precision. Chutzpah recommends that catering orders be made for 10 people and above, and that orders be placed a day before the actual delivery. By placing your order before 3PM the day prior to delivery, you give us enough time to prepare a feast that will be a big part of this special day. Our staff has been praised for friendly service and a thorough knowledge of our meal options, but that not be the only reason for choosing us. A great meal is enough, but it gets better when the portions are large and worthy of money spent. You just need to look at our 10-people platters to believe us when we say we serve some of the most generous portions in this part of the city. Do you fancy overflowing sandwiches? So do we! Jewish meals are soulful and best when shared and this is what we serve every day. Chutzpah was started to create a sense of community, and whether you walk in alone or in a group, you will feel this. Our catering services make it possible to share great meals with those you love. Whether you are in the mood for beef brisket or noodles, or even a yummy salad, you will be served at Chutzpah. While the main meals are mouth-watering, you have to check out the dessert corner for baked goodies that will warm your heart. Sumptuous soups are welcome at any time. You don’t have to leave the house to place an order for your event. With Chutzpah’s online order system, we recommend that you place your order by 3PM the day prior to delivery to give us enough time to prepare the meal and deliver it to your doorstep. You have several payment options including cash, personal checks, corporate check and accounts, as well as credit cards. If you didn’t know who to call for your Brit shalom catering, now you do! This place is great. Wide and unusual variety of deli sandwiches plus great burgers and other plates. Have Questions About Brit Shalom Catering?